Karen Travis is a name both Gears of War and Halo fans are becoming more and more familiar with - she's shaped the script for the Gears games, written a few books that tie into the franchise (such as Aspho Fields), dipped her toes into Halo with the short story Human Weakness and now she's jumped into the deep end of the Halo pool with her first full Halo novel, Halo: Grasslands. It's a sequel to the very popular Ghosts of Onyx novel. Travis sat down with her publicist for an interview as part of the promotional round for Grasslands. Here's a taste of the interview. Justin Golenbock: How did you first become involved with the HALO franchise? Karen Traviss: I was asked if I wanted to write a novella for HALO: Evolutions. I’m endlessly curious and always up for anything new if it sounds cool so I was interested. I was working on Gears at the time (as I still am) so I wanted to be sure they were cool with it, and they thought it was a great idea. If it’s military, if it’s a game, if it’s an IP I know nothing about (essential—I can’t work on things that I might have a pre-existing opinion on) and it has the moral grey areas I work best in, then I’ll probably give it a go if I have the time. 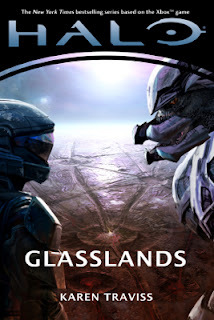 JG: Glasslands has been highly-anticipated by HALO fans as the first book or game in the franchise to delve deep into the chaos of the post-HALO 3 universe. Can you reveal anything about the plot for eager gamers and readers? KT: As a former defence correspondent and a military writer, I approach HALO as a real situation. War is bad enough, but when a relatively straightforward war—two sides, clear stakes—ends, then fragmentation usually takes place. Hostility doesn’t end cleanly. Factions emerge. You’re not sure where the threat is coming from, and it keeps changing. In HALO, it’s like the end of the Cold War. So who operates best in this uncertain landscape, where conventional force – weapons and ships – have no targets or conventional wars to fight? Intelligence. Enter ONI, the Office of Naval Intelligence. If your enemy is off balance and licking his wounds, you grab that chance to knock him down so hard he never gets up again. You use black ops techniques using smart, adaptable people who can operate off the grid and handle themselves in the most dangerous environments in deniable operations. ONI assembles a team of ODSTs, a Spartan II, a civilian Sangheili expert, and an AI spy. It ought to be a simple case of doing the dirty on the bad guys by sneaky means, but things get very complicated when the secret roots of the Spartan programme is blown wide open…. ONI also has its hands full with another problem—Halsey has been a very bad girl and strolled off with a few Spartans mid-battle. While they’re hunting for her, she’s stranded in a Dyson sphere with “her” Spartans, some Spartan IIIs she views as third rate, and Chief Mendez. It’s a sealed world. They could be the last sentient life in the galaxy. They don’t know if the Dyson sphere will turn out to be a haven or a hell, or indeed if it’s already inhabited. They’re cooped up with one another for what might be forever and now they have to face the previously unspoken tension, guilt, and blame about a shocking era in Earth’s history – the terrible abuse of kidnapped children to create Spartans. It’s very uncomfortable and now it’s about to get personal and really painful. Cue mayhem! Get the full Karen Travis interview over here! Harley Quinn is an MC Hammer fan? Where are the Halo Anniversary Terminals located? Where are the Halo: CE Anniversary skulls found? It's the Chief's birthday cake! What is Bioware's new franchise?